Where can you find the best Commercial Carpet Cleaning in Joplin Mo? Let me tell you a personal, true story. A couple of weeks ago my brother told me he needed to visit a chiropractor. He selected one based on a little that he had heard. As he sat in the waiting room he told me he couldn’t help but notice that the carpets on the floor were filthy. The thought that he had was, “if this is how they take care of their office, how can I expect them to take proper care of me”? The appearance of your business is very important to the image that you project to your customers or clients. Many businesses go out of their way to select furnishings and decor that creates the “correct”image. This is simply good business. It is however important to keep up your best business image. If the upholstery in your waiting room is dirty or stained, if the carpets have clear dirty traffic trails complete with spots and stains or dirt and grime in the corners of the room, your clients DO notice. It may well be that they do not say anything, but be sure they are forming an opinion of your business. At Crystal Clean Carpets we are experts at low moisture carpet cleaning. We do not need to drag hoses through open doors. Our cleaning process is completely self contained. Our low moisture carpet and upholstery cleaning offers very quick drying times. You will not have to worry about damp carpet or upholstery during business hours. 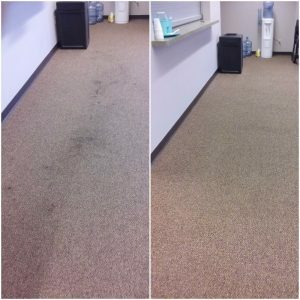 Why are we the best choice for commercial carpet cleaning in Joplin MO? At Crystal Clean Carpets we never use soap bases cleaners. Our encapsulate cleaning chemicals dry and crystallize and are completely vacuumed away. There is never a sticky soap residue left in your carpet. Your carpet will stay cleaner longer. Our encapsulate is over 97% bio-degradable and is completely safe for people and pets. We understand that you are running a business. We offer flexible hours to meet your requirements. For commercial accounts we will clean early mornings, evenings, or on Saturday, whatever will fit your business hours of operation. Here again it really helps that our cleaning process offers drying times in about an hour. Call Crystal Clean Carpets. Your satisfaction is guaranteed. We will help you put your very best business foot forward. Your clients may not notice how sparkling clean your office’s are, but they WILL notice if they are not!